Designed to replicate the paint scheme on Sukhoi Su-30 demonstration aircraft, these F-15 markings are for the only aircraft of the 65th Aggressor Squadron to be painted in this manner. My copy of the decals has all three scales represented, 72nd, 48th and 32nd. The one thing about Twobobs products is the level of research that goes into a product. This sheet is no different. The instruction sheet is printed on high, full color paper and contains some small photos of the real thing. The instructions provide a listing of the accessories that are available, and not just the ones available through Twobobs. The background of the full color instruction sheet will aid and inspire the modeler. The instructions provide four-view drawings that provide the modeler with an excellent reference for markings placement. This aircraft will be a masking "fun time". The decals are printed by Microscale, with the two large sheets being in perfect register with plenty of colors. The decals are on three separate sheets. 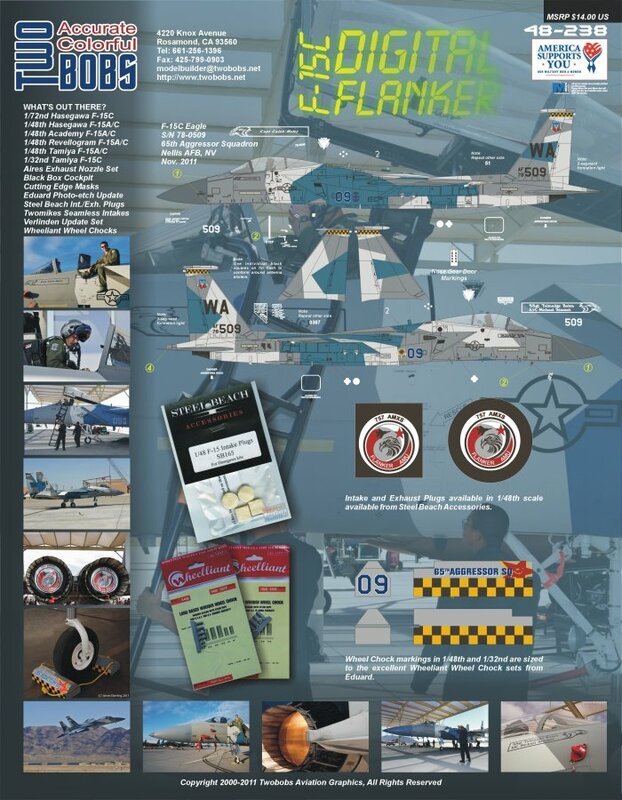 One sheet is 5x8 and it includes the 1/72nd and 1/48th scale markings, as well as some 1/32nd ones. The next sheet is slightly smaller at 4.5x7 and has all the remaining 1/32nd scale decals. A very small sheet of 1x2 has the flare and chaff dispenser and some decals for the wheel chocks. This little sheet is slightly off-register on the white but they will add to the Wheeliant chocks should you have them. This is a nice touch. All in all, this product is a very complete package. Twobobs definitely has some of the best aircraft decals in the world. The level of research shows the passion that Twobobs has for this subject matter. Microscale-printed decals and high quality instructions - everything you could ask for in a decal product. Thanks to Twobobs and IPMS/USA for the review copy. You can obtain yours by contacting Twobobs directly or through various hobby shops and online retailers.